Rich As A King is a combination of many elements: chess and financial planning, strategy and tactics, setting goals and realizing your dreams. We are now proud to present another winning combination – art and inspiration, in the form of our new poster book. We have received many positive responses about Rich As A King from our readers. 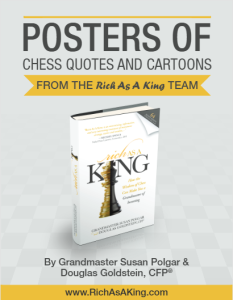 Apart from the information that this bestselling book provides, many readers enjoy its illustrations, cartoons, and wealth of inspiring chess quotes. For this reason, we decided to put the quotes together with the illustrations in the form of a new poster book. Print out these colorful posters so that you can put them up at home, in your office, or at your local chess club. Each one is attractive to look at, inspiring, and creative. For a limited time, we are offering the poster book as a free gift. All you need to do is go to www.RichAsAKing.com/poster and get your free download. If you enjoy this unique book, share this link with your friends and on social media. Get inspired and continue to enjoy reading Rich As A King! Douglas Goldstein, co-author of Rich As A King: How the Wisdom of Chess Can Make You A Grandmaster of Investing, is an avid chess fan, international investment advisor, and Certified Financial Planner (CFP®).